The objective of this project is to design the solar based Electromagnetic breaking system using Object sensor for Automobiles. This project is mainly used in Vehicles either two or four wheelers. In this project is used in real time we can avoid so many accidents. The object sensor senses the object and gives corresponding signals. These electrical signals are very small mill voltage signal, so it is given to amplifier circuit. The amplifier circuit is constructed with operational amplifier which acts as power amplifier. Then the amplifier signal is given to signal conditioning unit which also constructed with operational amplifier. In this circuit operational amplifier act as comparator and generate the square pulse given to microcontroller. The microcontroller may be ATMEL/PIC/RENESAS/ARM microcontroller. It will work according to our object already we have programmed. According to the object sensor value, the microcontroller activates the driver circuit as per mentioned in the program. 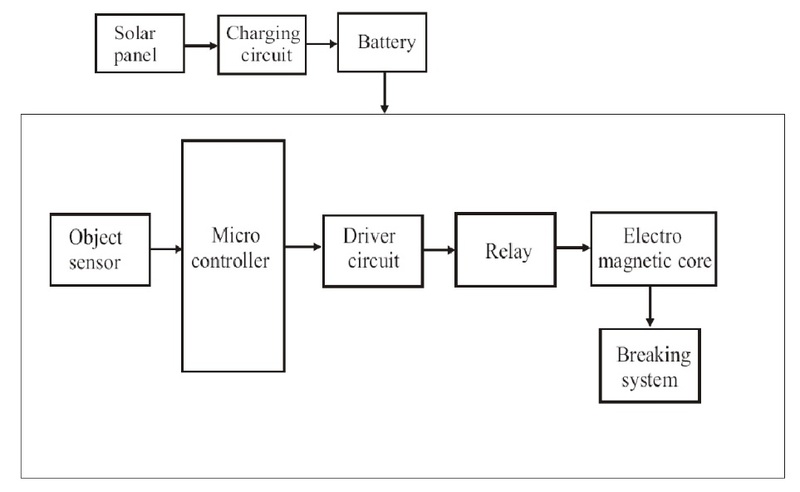 The driver circuit is constructed with transistor which acts as switch to control the relay. The relay output is directly connected to the electromagnetic core which is attached in the breaking system. Whenever we control the break, at the time what happens in the system means one of the coil winding is placed around it. It generates the electromotive force and it’s fitted with the suitable mechanical set. Likewise when we release the break the force generation will be stopped and the coil winding releases from the mechanical set. Entire kit is controlled by only solar power. Solar panel consists of number of silicon cells, when sun light falls on this panel it generate the voltage signals then these voltage signals given to charging circuit. Depends on the panel board size the generated voltage amount is increased. In charging circuit the voltage signal from the board is gathered together and stored in the battery. The battery power is used to control the vehicle. This project is very useful for automobile industries.